The egg biscuit. It is a very simple cookie which has it's roots in the Italian-American culture. It's a favorite with afternoon tea, especially among the older generation of Italian Rhode Islanders. My version is a lactose-free version using lite coconut milk. I actually prefer this recipe to the original. Mix sugar, oil, eggs and extracts with beater. Gradually add the dry ingredients alternately with milk. If the dough is too sticky, add more flour. Set on a floured board. Take about a tablespoon of dough and roll into 6 or 7 inch ropes, twisting into ball-shaped knots. Place on a parchment lined cookie sheet; bake for 5 minutes and turn pan. Bake for another 4-5 minutes or until light brown on the bottom (approximately 9 to 10 minutes total). Add coconut milk and a few drops of vanilla extract to confectioners sugar until it reaches a spreadable consistency. 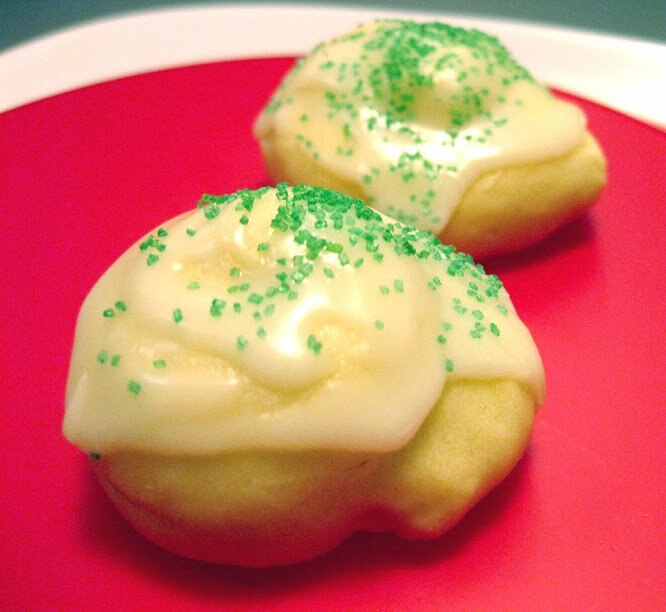 Frost each cookie with about a tablespoon of icing. Add colored sprinkles while the icing is wet.